The most busy and important railway route in Bangaldesh is Dhaka to Chittagong. So severally people need to know Dhaka to Chittagong train schedule and ticket price as well. So in this article we will discuss both the train schedule and ticket fare. Seven Trains Up and down from Dhaka to Chittagong and Chittagong to Dhaka. We will mention them one by one both in a text format and a table. Note: If you like to see train schedule and price in text please scroll down. 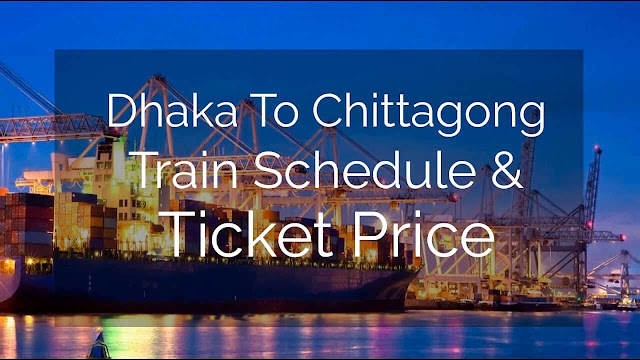 From Dhaka to Chittagong and Chittagong to Dhaka Train ticket price are same and even it's almost similar to the all trains. Check the table below hope you will get a clear concept from here. This train leaves the Capital at 3.00 PM from Komlapur Railway Station. Then it reach to Bimanbondor station or Airport Station. Subarna Express off day from Dhaka is Friday means subarna express does not launch any trip from Dhaka in Friday. If you want to start your journey from Airport then Check Airport Railway station train schedule. Subarna Express leaves Ctg at 6:40 AM. Check out Subarna Express ticket Price from above. Mohanagr Goduli express leaves Dhaka 4:20 PM and On return leaves Ctg. at 3:00 PM. This tain has no off day just carrying passengers restlessly. Mohanagar Goduli Express ticket fare is same like other Chittagong Train. The major stoppage of Mahanagor Goduli Express are Feni, Comilla, Akhaura, B. Baria. Bhairab Bazar. This train also don't have any off day, non stop serving to the people of Bangladesh. Mohanagor Provati leaves the capital at 7:40 AM and from Ctg it start it's journey at 7.15 AM. Mohanagor Provati off at Sunday. The fare of ac berth-is it per person or persons berth?